Did any of you ever regret you were not born in the Tretha Yuga when Rama was around ? Did any of you regret that you were not born in the Dwapara Yuga when Krishna was around ? Forget that regret and rejoice! You are privileged to be born in this Kali Yuga when Sri Sri Ganapathy Sachchidananda Swamiji is around ! His Holiness is the Supreme Trinity personified ! (paritranaya–for the deliverance; sadhunam–of the devotees; vinasaya–for the annihilation; ca–also; duskrtam–of the miscreants; dharma–principles of righteousness; samsthapana-arthaya–to reestablish; sambhavami–I do appear; yuge–millennium; yuge–after millennium. Both of them decided to visit the Earth because they wanted to remove the difficulties of their ‘true’ devotees. Appaji does it with a difference.. He reaches out to you – through whichever media you are comfortable with. You know, Rama and Krishna could be experienced only by people who were present in their part of the world. Our Gurudeva is omnipresent.. Whichever part of this earth you are in, our Gurudeva reaches out to you through the cloud and the internet. And, all of us can feel His presence in our hearts when we just close our eyes and sit in meditation and prayer. There is only one condition for this miracle to work for you.. You are a ‘true’ devotee.. Meaning you are as true a devotee as Hanuman and that little squirrel were to Ram, or Arjuna and Kuchela were to Krishna. Oh dear Appaji! Give us the wisdom to be your ‘true’ devotees. A million pranams at your holy feet for such an enlightening MMS. వీడియోలో దత్తాత్రేయుడే సద్గురువు గణపతి సచ్చిదానందునిగా అవతరించినట్లు చాలా చక్కగా చూపించినారు. దత్త భక్తులందరి ఇక్కట్లు తీర్చే ఏకైక దిక్కు సద్గురువు గణపతి సచ్చిదానందుడే! అందుకు భక్తులందరూ చేయవలసినదల్లా గురుదేవుల ఆజ్ఞలను శిరసావహించటం మరియు సూచనలను తు.చ తప్పక పాటించడమే. Jaya Guru Datta, Appaji! What a powerful video this morning! So many people wonder why we have a Guru, but unless one experiences how the Guru’s grace transforms our lives it is difficult to say! Once you told us to not force having a Guru on your friends and family. Instead, you told us to let them see what happens in our lives and then they will understand. My own mother at first was very opposed to the notion of Guru, but by the time she died, whenever anything was happening in my life even she would ask first what has Swamiji advised. More than once in the last years her instruction to me was to not make any decisions until I saw Appaji because He always had my best interests at heart and had always steered me in the right direction. What this lifetime would have been without you is inconceivable! With deepest pranams, Jaya Guru Datta! Puttuji, to hear this powerful message from God Himself,with the beautiful music, definitely we are true devotees and blessed !! With the wisdom of sampling I surrender to our Lord Appaji who is with us always !! Beautiful video and totally loved the way Swamiji read out the message. I have read life histories of many saints but I have never come across a saint like Sri Ganapathy Sachchidananda Swamiji. All the previous saints drew devotees to them but only Sri Swamiji travels across the globe more than 8 months in a year reaching out to people, removing their difficulties, showing them the right path and elevating them. He establishes many ashramas across the world to help develop devotion to god, learn the art of sefless service and understand dharma. He reaches out to every generation of people through internet ex: Facebook, Vimeo, Youtube, Google Plus, emails etc. in multiple ways to help transform our inner personalities. Let us try to understand the love that is being showered by this mahatma and be true devotees. Humble prostrations to the lotus feet of Sri Swamiji who is bhakta vatsala. Jgd.Sadguru is the Brahma,the ultimate truth and reality. This is a beautiful reminder to all. Thank you Appaji for this. What an absolutely wonderful and hearttouching MMS! Thank You, dear Appaji ! Thank You Puttuji! How true are this words, how true! So many many many times I realised Appaji`s help! And how many times I did`nt! I never never never can thank You enough, beloved Sadgurudeva! Thank You, dearest Appaji for beeing always with me! S.G.D.! It is a big big big Blessing that Swamiji hase come in my life. Since I am working with Swamiji, my life has changed a lot. Now I can feel and hear Swamiji always in me, he is always helping me. Just Yesterday I got the first time Bhakti Mala from the Ashram. Today I read some pages and sudenly I could feel a wonderful contact to Swamiji. It was very strong. I read the words and I felt how Swamiji is speaking to me. I read words which gave me answer to different questions. All this are the blessings of Swamiji, it is so much, so great, I am so thankful! Appearance of Appaji in this Video thrilled me..!!! I pray to the Lotus feet of Sri Swamiji to help us becoming the ‘True’ devotees. In the explanation message Puttugam Ji said that True devotee should be as good as a devotee as Hanuman and like that little squirrill. 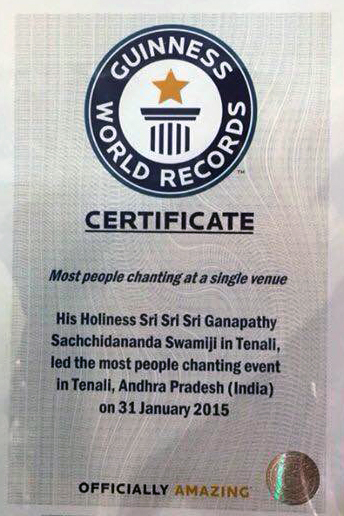 With the blessings of Sadguru Deva and our efforts, I hope we’ll reach such a position one day. Jaya Guru Datta Sri Guru Datta. Verily our Swamiji is god himself. Countless devotees, myself included have experienced miracles and transformations that could only be attributed to the supreme divine power that is manifest in Sri Sri Sri Ganapati Sachidananda. Mere words cannot explain the effect of his presence in one’s life. We are extremely lucky to have Lord Dattatreya himself minister to us. It is our duty to follow his instructions and constantly have him in our hearts. Then growth wil occur that you never thought possible. The beautiful bhajan is from the ‘Guru Charana puja’ album which also has puja chants to Swamiji and other wonderful bhajans that praise him as god. It is very powerful, all devotees should have it. I don’t know what to say, or what to write here! I hardly have words! Amma pampina Amrutha Bhaandamu, Meeru! This life is beautiful! Difficulties and other garbage is there, was there, has been there, and will be there…who cares! This life is beautiful with Your presence! Jaya Jaya Datta! Jaya Lakshmi Datta! I have several personal experiences to testify my Sadguru Ganapathy Sachchidananda Swamiji saved us from many danger and impending calamities. I know dearest Sadguru that You are God incarnated and still my mind can’t crasp this miracle. I hope to follow Your directions and become a true devotee. JAI Guru Datta, Sri Guru Datta. We are all so blessed to have Sri Swamiji in our lives. He is constantly there removing difficulties. Every minute, every hour, every day. Thank you so much, Puttuji, for this wonderful MMS. It is so beautiful. Our Pujya Sri Swamiji is our Rama and Krishna who is guiding us in a daily basis to remove our ignorance and darkness and show us light in our lives. Jaya Guru Datta. JGD, Thank You Appaji for your daily pertinent MMS . I pray that we drink from the ocean of wisdom and please help us to imbibe these golden words. Thank You for removing our difficulties continuously SGD. Om Namo Hanumate Namaha! Very Very true. Appaji has come in various forms and saved me and my family. I pray to Datta for the same grace to continue! Yes, Appaji. Thank You. Space Guru! Dear APPAJI. radhakrishnan LIKED THE MESSAGE,GOD INCARNATES AS guru. Jai Guru Datta, we are trully blessed that we are under our Guru’s Sharan. Our humble prayers that we continue to imbibe your teachings Swami Ji and always strive to be true devotees. गुरू के रहते डर कैसा? यदि कोई सिर्फ और सिर्फ उसे देखता है और उसकी लीलाओं को सुनता है और खुद को उसमें समर्पित करता है तो वह भगवान तक पंहुचेगा , क्योंकि …..
गुरू ही भगवान है !!!!! దత్త దేవుడే మన కోసం గణపతి సచ్చిదానందుడిగా అవతరించారు. మనకు ఆయన పాదాల యందు అచంచల భక్తీ, విశ్వాసం నిరంతరంగా ఉండేటట్లు అనుగ్రహించమని ప్రార్దన చేద్దాము. దత్త భక్తులందరినీ కంటికి రెప్పలా అనుక్షనము కాపాడుతున్న గురు దేవుల పాద పద్మములకు శత కోటి వందనములు. God incarnates as Guru” is a very revealing message of Sri Swamiji. The saying “Sivaya Guravenamah” in the Guru Githa has highlighted the sinificsnce of Guru as the incarnation of God. Sri Swamiji rightly emphasizes the role of Guru for our benefit and guidance. Jaya Guru Datta! Jaya Guru Datta Puttuji !!!!! JAYA GURU SHIVA GURU HARI GURURAM JAGADGURU PARAMGURU SADGURU SHYAM !!! Sree Guru Datta !!!! ,we are very much grateful to you for providing such a wonderful messages……..
Gems of gem MMS videos one after the another… words really cannot explain how beautifully and meaningfully each of this video is done. Each of this MMS video is like a energized capsule sent into space(Internet) everyday for the sake of us devotees and get daily blessings. Pujya guru deva is making very easy for us, so just by click of a button we can watch these videos and be blessed. That is the beauty of these SGS-MMS messages. I would like to re-iterate, blessed are we to be born in the time when Pujya Guru Deva who is the incarnation of Lord Dattatreya, has taken human form to protect His true devotees. I have not seen Rama of treta yuga, i have not seen the Krishna of dwapara yuga….. but i have seen the Rama and Krishna of this Kali yuga in our pujya guru deva sri swamiji. Thank you Puttuji for the everyday detailed explanation on each of the SGS MMS video. Wow, first time in this MMS video Appaji talks… what a e-blessing. My humble pranams to the lotus feet of pujya guru deva Sri Swamiji. Please bless us to always serve at Sri Swamiji’s lotus feet and become a true devotees. Jaya Guru Datta. Lord Dattatreya devotees are really very very lucky as he incarnated in this yuga as our beloved Appaji. He is taking care of us always and he is with us always,we have so many miracles happening daily. Dear Sri Swamiji please bless us to serve you we are always at your feet. Jaya Guru datta.God incarnated as a guru in my heart and he removed the difficulties of my life,Thank you Sri Swamiji. Our koti Pranams at our dear Guruji’s lotus feet. We don’t know how to thank him for his grace and kindness. These beautiful life and being able to witness His messages is our fortune. Please keep blessing us to be able to perform seva and include us in your activities. Für mich ist dieses Video sehr eindrücklich. SWAMIJI spricht „live“ und ich schaue in die Weite des Sternenhimmels. In diesen unendlichen Lichtern spüre ich, dass unser GURU aus diesem Sternenmeer SEINE/IHRE wunderschöne Gestalt angenommen hat, um die Schwierigkeiten von wahren Devotees zu vermindern. Das berührt mich zu tiefst. Und ich frage mich, was eine wahre Devotee ist und wünsche mir so sehr, dass ich auch dazu gehöre. Ich weiß nicht, ob ich in deinen Augen ein wahrer, guter oder schlechter Verehrer bin, aber — Vielen Dank für all Deine Hilfe! I don´t know, whether in YOUR eyes I am a true, good or bad devotee, but — Thank YOU for all YOUR Help! Absolute Thathvam. I am eternally grateful for my association with my Sathguru. He carries me all the time.